World-renowned Nobel Peace Prize laureate, Holocaust educator and human rights activist passes away aged 87. Holocaust survivor, activist and Nobel Peace Prize laureate Elie Wiesel passed away Saturday aged 87. Wiesel was born in 1928 in the Romanian town of Sighet. In 1940, when the town was annexed by Hungary's anti-Semitic government, Wiesel and his family were deported together with thousands of other Jews into ghettos. In 1944, after the Nazis took over Hungary, the entire Jewish community of Sighet was deported to the Auschwitz-Birkenau death camp. Elie Wiesel - together with his father Shlomo - was sent to the Buna Werke labor camp within Auschwitz III-Monowitz, where they spent the next eight months, before being shunted to various other concentration camps as the Allies moved in. His father was beaten to death towards the end of the war by a Nazi camp guard, and his mother and sister also perished in Nazi camps. Only two members of his immediate family survived: his older sisters Beatrice and Hilda. It was based on those experiences that Wiesel wrote his world-famous memoir Night, which recounted his harrowing time as a teenage inmate of the most infamous death camp of the Holocaust. Following World War Two, Wiesel became a journalist, and later spent his life promoting human rights and Holocaust education, gain international acclaim as a writer, speaker and activist. Wiesel received scores of awards for his human rights activism, including more than 100 honorary doctorates, the U.S. Presidential Medal of Freedom, the Israeli President's Medal of Distinction, the rank of Grand-Croix in France’s Legion of Honor, a British knighthood and, most famously the Nobel Peace Prize in 1986 for his role in speaking out against violence, repression and racism. He also received the Hungarian Grand Cross Order of Merit award in 2009 - but in 2012 handed it back in protest of, in his words the "whitewashing of tragic and criminal episodes" regarding Hungary's role in advancing Nazi policies during the Holocaust. The indefatigable activist also served in many positions promoting human rights and Holocaust education worldwide. From 1978, to 1986, he served as the chairman of the United States' Presidential Commission on the Holocaust. During his tenure Wiesel led efforts to establish the U.S. Holocaust Memorial Museum in Washington, D.C. To this day his famous words urging the world to never forget the horrors and lessons of the Holocaust - "for the dead and the living, we must bear witness" - are etched in stone at the museum's entrance. The same year he stepped down from that position, he founded together with his wife the Elie Wiesel Foundation for Humanity, which works to fight intolerance throughout the world, particularly via youth work. 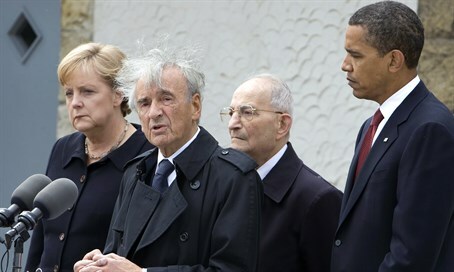 Wiesel would also get the chance to bring to justice some of those responsible for the Holocaust. In 1987, he was a witness in the trial of Nazi war criminal Klaus Barbie in France, during which he recounted his own horrific experiences at Auschwitz. He was also appointed to head the International Commission for the Study of the Holocaust in Romania - whose study was later adopted by the Romanian government - which blamed Romanian authorities for the deaths of some 280,000-380,000 Jews and over 11,000 Roma during the war. Elie Wiesel's human rights activism reached far beyond the legacies of the Holocaust, however. Among other campaigns in which he figured prominently were the fight against apartheid in South Africa, the Argentinian regime's crimes during the country's Dirty War, the Bosnian genocide, and many others. He also served on the International Council of the Human Rights Foundation. Wiesel was a staunch supporter of the State of Israel and Jewish causes in general, including the campaign for Soviet Jewry, as well as the efforts to evacuate Ethiopian Jewry to Israel. He was never afraid of fighting Israel's corner in the international arena, even in the face of pressure from world leaders. Most recently, Wiesel was an outspoken critic of the US administration's policy of appeasement regarding Iran's nuclear program, and in 2013 took out a full-page ad in the New York Times urging the American government to settle for no less than the total dismantlement of Tehran's nuclear program. Wiesel was famously present in Congress during Israeli Prime Minister Binyamin Netanyahu's impassioned last-ditch effort to dissuade the US government from cutting a "bad deal" with Iran. He is survived by his wife Marion, son Shlomo Elisha Wiesel, stepdaughter Jennifer and two grandchildren.